One glance at the numbers, and it’s easy to see why pundits are already calling 2012 “the Twitter election.” More Tweets are sent every two days today than had ever been sent prior to Election Day 2008 — and Election Day 2008’s Tweet volume represents only about six minutes of Tweets today. All this explosive growth in conversation has fueled Twitter as a platform for civic debate and created a massive data set for analysis. Today, we’re launching the Twitter Political Index, a daily measurement of Twitter users’ feelings towards the candidates as expressed in nearly two million Tweets each week. Each day, the Index evaluates and weighs the sentiment of Tweets mentioning Obama or Romney relative to the more than 400 million Tweets sent on all other topics. 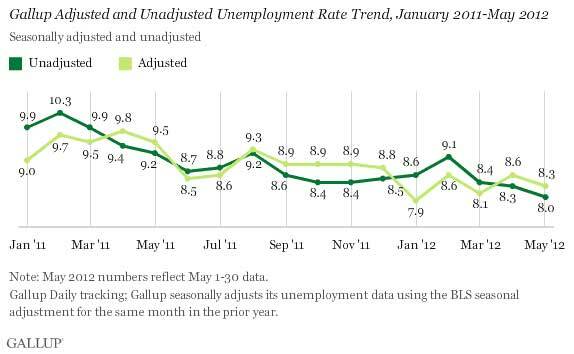 The trend in Twitter Political Index scores for President Obama over the last two years often parallel his approval ratings from Gallup, frequently even hinting at where the poll numbers are headed. As Britain prepares to celebrate Queen Elizabeth II’s 60th year on the throne, the sovereign’s popularity in the United States is at a 15-year high — 82% of Americans say they have a favorable opinion of the queen in a CNN/ORC poll released Friday. That’s a 35-point jump from 1997, when her favorable rating stood at 47%. That was the year Princess Diana died in a car crash in Paris. Many Americans and Brits were disappointed in the royal family’s handling of the death of the “people’s princess,” saying the queen didn’t sufficiently reflect her subjects’ sense of loss following the accident. Since then, however, Queen Elizabeth’s favorable ratings have been on the rise, reaching 75% in 2002 and 80% in 2007. “Americans love Queen Elizabeth and they think the royal family is a good thing for the people of England, but only one in eight would like to see royalty here in the United States,” CNN Polling Director Keating Holland said. Prince Philip, the queen’s husband, is not as popular as his wife, though is still viewed favorably by 59% of Americans. 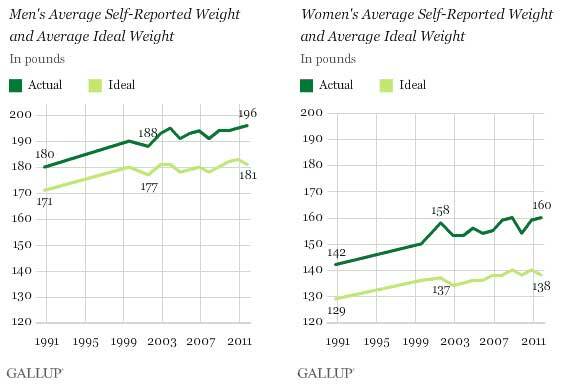 The latest Gallup poll on weight is scary. In the last twenty years our standards for weight have changed. We actually believe we need to be larger. Of course, this could be due to us all getting taller, moving away from skinny as ideal, or the obvious obesity epidemic. The latter is most likely true. If you put these average weights into the CDC’s body mass index calculator, then our averages are way overweight, borderline obese.